Indian Army has given the open solider recruitment notification in district of Andhra Pradesh. Interested and physically fit applicant can participate for this jobs In India Army Recruitment Andhra Pradesh October 2014. 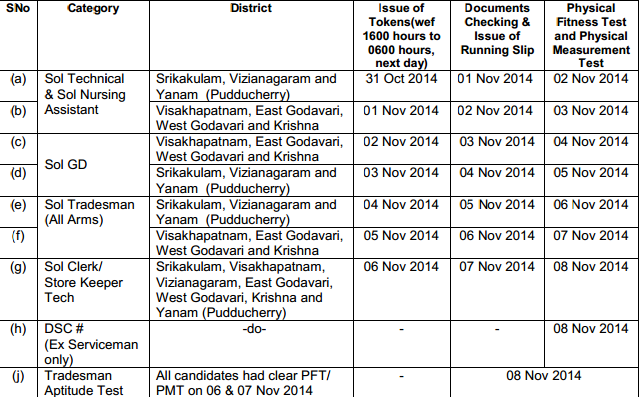 This army recruitment rally will be conducted at kodi rama murthy stadium, srikakulam from 01 - 08 November 2014 for 800 soldiers in different categories. All applicant must carry the original documents and two photocopies each relevant certificate and colored passport size photographs.